Apparently it can also be found grazing on the oval from time to time. You know, there’s a fox living somewhere in the Mawson/Isaacs area, it wanders the streets at night. The dead washing machine on the front porch is a nice touch too. The washing machine is for sale for $60. hey is that sheep wearing a wooly jumper ? Thumper, he’s lucky to have been able to hold onto his breeders this long. The Goulburn graziers pretty much all gave up last year and sent them off to the abattoirs. And many of them drove themselves broke trying to hold onto them that long. It will take everyone decades and big $$$$s to rebuild their herds. Meanwhile the land is getting sooo empty. And of course when it does finally rain and there is nothing out there to eat the new growth – lots of fuel come the next summer…we all know what that means. my old man sold 200 the other day for 25 cents a head. At the moment he’s keeping his breeding stock, the super fine wool (14.7 micron I think), but it’s costing him a fortune to feed them. Fairchild: many sheepgrowers will not bring agisted stock back onto their property – they just use the agistment as a holding pattern until they can get better prices (why when sheep are selling for 60c each are we still paying $24/kg for lamb?). They don’t bring them back because they also spend years trying to get rid of weeds and pests like fluke on their properties, and they can’t guarantee what comes back with the agisted stock seed and pest-wise. Think that’s the house, yeah there’s only one now. 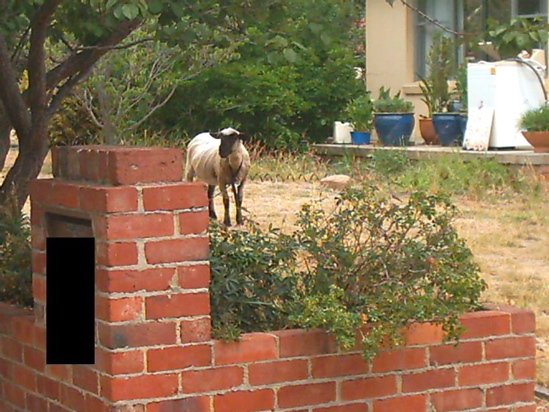 There have been a couple of sheep there on the corner of Maitland and Madigan for years. They were there on and off when I lived in Hackett between 1997 and 2002. This was the norm in Qbn in the 1960 – before there were proper blocks and fenclines – well so my mother told me. He(?) is tethered to a stake in the yard, thus the collar is necessary. Looks like some kind of fancy foreign sheep. And he has a collar! if this is the sheep i remember (i grewed up in hackett) weren’t there two of them? At least it didn’t wind up at the knackery. Maybe others should think about taking on some poor farmers prize stock over the drought period and then returning it to them when the feed and water levels come up again and in doing so could keep the Australian sheep lineage healthy. After all some of these sheep have taken generations to develope. Pity about the eyesore created by the overgrown block…owner seems to have unrealistic ideas of the sheep’s grass eating abilities.